I fell in love with watermelon as a kid. Juicy, sweet, and available only in the summer, watermelon was a special treat. We ate it by the slices, spitting out the seeds, or saving them for later (we’d pop them in the mouth and split the seed with our teeth, enjoying the sweet white flesh). I remember my Dad telling us stories of his youth when he’d split the watermelon in half and scoop out its flesh with a spoon. It sounded so indulgent and decadent to me! One summer, when visiting my dad’s relatives, I tasted pickled watermelon. As a child, it didn’t sound as strange to me as it might sound to most adults these days. Maybe it’s because even back then I was obsessed with everything pickled. I suppose, that experience has prepared me to accept and embrace watermelon in savory preparation. I still remember the day I discovered the taste of watermelon salad. It was during a restaurant week in Dallas, Texas. The restaurant was in one of my favorite Dallas neighborhoods (Knox/Henderson) – Hector’s on Henderson. They served the watermelon salad with red onion, feta cheese and basil. And from the first bite, I was hooked! I must’ve made the salad weekly for the entirety of the summer. Here is my version of the salad with Southwestern flavors. I use Mexican fresh cheese – Queso Fresco and cilantro. 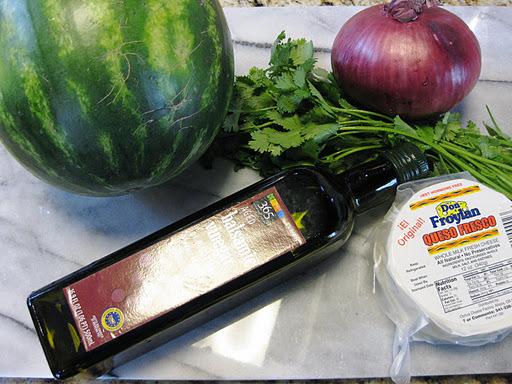 Balsamic glaze does a nice job of offsetting the sweetness from watermelon. If you prefer, you can use lime juice instead. 1. 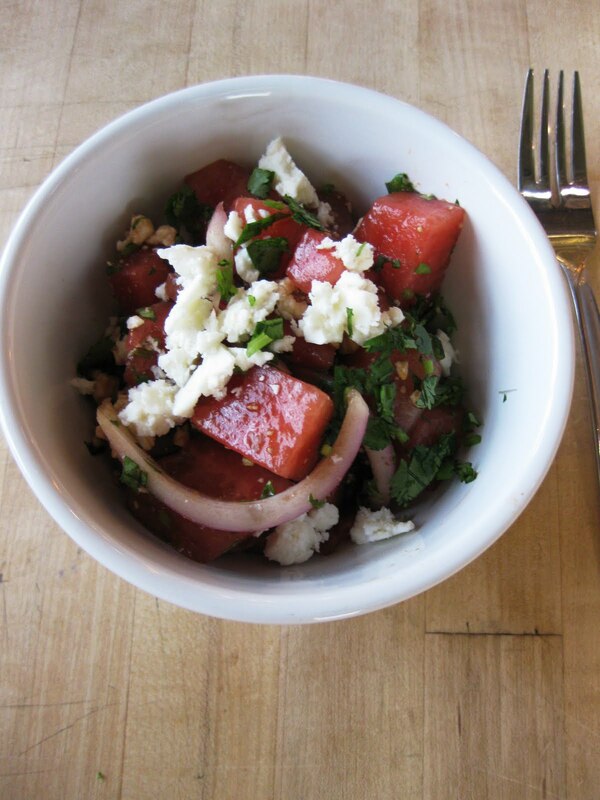 In a large bowl, gently combine watermelon, onion and cheese. Drizzle with Balsamic Glaze and garnish with cilantro. Season with coarsely ground black pepper. Eat immediately. You don’t want this salad to sit around. If you are sensitive to onions, soak sliced onion in iced water. This will make them milder and more crisp at the same time. Have a favorite way to eat watermelon? Please share!